Days go by. I am finding it extremely difficult to let go of the notion that the Nighthawks diner was a real diner, and not a total composite built of grocery stores, hamburger joints, and bakeries all cobbled together in the painter's imagination. The poetry of that idea is lovely and all, but I want the damn thing to have existed, in real time and space. And, if possible, to still be standing. Thinking again about that line from the Vogue editor who reported that Nighthawks was "based partly on an all-night coffee stand Hopper saw on Greenwich Avenue," I look back at the possible corners, second-guessing my rule-outs. Somewhere, there is the source, the brick-and-mortar genesis for the Nighthawks diner. A coffee stand on Greenwich Avenue. Walking north on Greenwich, I decide there's no way it's the nascent White Castle burger joint at Mulry Square. That's too far-off. That pointy florist was a newsstand/candy store, not a coffee shop. Two Boots Pizza has a glassy curve, but it was a bakery back then. Wait a minute--I'm thinking "diner" when the descriptive term is "coffee stand." Could a bakery be referred to as a coffee stand? 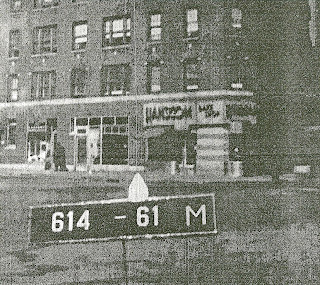 In the print-out of the tax photo, Two Boots was the Hanscom Bake Shop. Wouldn't they have served coffee? And maybe all night? It's very possible. 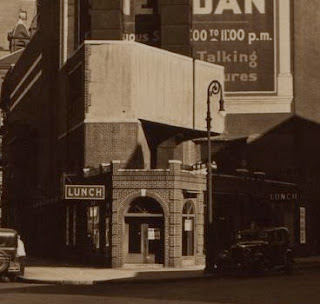 But then it could just as likely be the prow-shaped luncheonette, that surely also served coffee, behind the Loew's Sheridan theater, which Hopper was known to frequent as an avid movie fan. I could keep going back and forth, up and down Greenwich this way forever, deciding and undeciding, seeing Hopper diners everywhere and nowhere. The entire enterprise is maddening. And then there's that mystery diner at Block 613, Lot 62. Even though it's not on Greenwich Avenue, I return to the southwest corner of Mulry Square, where 7th Avenue South meets Perry. Maybe the Vogue editor was off by a block. What did those people at Vogue know from all-night coffee shops anyway? Obsessed, I look around for evidence of the one-story building that went up on this corner in 1942. No photo of it exists in the Municipal Archives tax records. 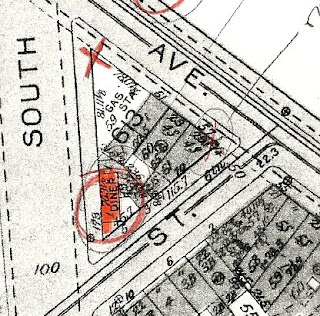 A mapmaker in the 1950s noted that it was a diner. By 1980, the two-story building that would become today's Empire Szechuan Village had taken its place, erasing it from our sight. I circle Empire Szechuan, hoping to find some remains of that diner. I don't know what I'm looking for--a rusted footing that once held a signpost, the ghosted outline of a curved glass front? Something. Then the oddly placed wedge of the entrance rings a bell. And I suddenly see it. From the Perry Street side, I see the old diner--the single story of bricks that still stands, holding up the addition of the second story. It was not demolished, only expanded. It's like looking at the young-woman, old-woman illusion, where first you see a withered crone, then your brain adjusts and the girl she used to be appears before your eyes. Thrilled by the possibility, I compare the bricks of the first story to the bricks of the second. They look like different bricks. The lines of mortar are deeper on the first story than they are on the second. I wonder if I am seeing things--things I want to see. But the clunky second story and the glassed dining room out front do look tacked on, like afterthoughts. I decide that this is, indeed, the lost DINER marked by the mapmaker in the 1950s Land Book. But is it the Hopper diner? Could it really still be standing, still serving food, hidden beneath the blocky augmentations and red paint of a Chinese restaurant? Or have I stumbled upon another near miss, another "close but no cigar" facsimile of the Nighthawks inspiration? I want the Nighthawks diner to be buried in these bricks, because they are still here. Or if not these bricks, then let it be the bakery that became Two Boots, because I can still put my hand on that curve of glass, because the soul of that lonely coffee shop remains in its blunt, solid particulars. But the ultimate truth remains bitterly out of reach. It is time to give up the search. *Once again, thanks to blogger Teri Tynes and singer/songwriter Don Everett Pearce, who pointed me to NYPL photos and offered their theories, launching me on this obsessive search and pushing me to the bitter end. Nice research... But you'll be surprised to hear how sexually active were the teenagers who prowled the balconies of the Loew's Sheridan movie house in those pre-birth control years. There's definitely a book in that, which I have been researching, remembering and making up for a few months. Very impressive Edward Hopper research. Have really enjoyed the whole painstaking quest. Thank-you. Ahhh, bittersweet ending. Thanks for letting me play. May everyone find their lost diner. Impressive work. 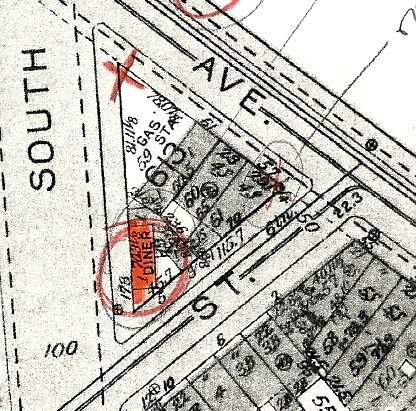 I think the mystery diner that went up in 1941 was most likely a prefabricated metal diner, which may have been later encased in brick. The Certificate of Occupancy refers to "construction classification: metal." 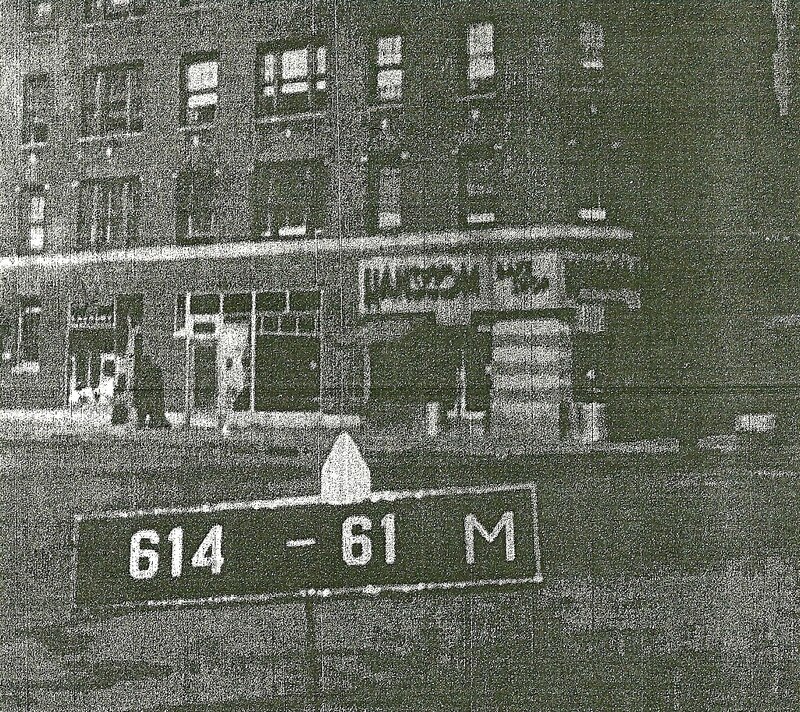 If you go to Christopher Gray's site (www.metrohistory.com) you can enter the New Building (NB) number from the C of O into his database and find that the diner on this corner was a 1-story "metal lunch wagon." The luncheonette behind the Sheridan had large plate glass windows on the side. Seems to me that Hopper viewed patrons through the windows and then took artistic license in re-creating the scene. Thanks for a fun and suspenseful read. Amazing research, the old fashioned way - looking things up in old city archives. A lot of things are possible. It's possible he made the whole diner up, that it was in a different location despite what's been said, and on and on. It never struck me as being in NY. Maybe it was the very Hopper backdrop, or the huge glass that is not typical NY diner-style, but I never thought of it as NY. St. Louis, but not NY. I still believe too that it is there and can be seen by those looking for it...beautiful piece. Was wondering what people thought was going on in Hopper's painting??? To me there is a strength and fragility about these people drinking their coffee--an isolation--a hard driving New York back in the day. The building on the south side of Mulry Sq is also formerly referred to 3-5 Perry Street. Wonder if a search of that address would bring up anything up like a coffee stand? I've done a mini-search and nothing yet. Also, many people confuse Greenwich Street and Greenwich Ave. Not to open a new can of worms, but Greenwich Street could be an outside possibility. I have given it a look on google street view, but nothing jumps out at me. Thanks again for the addictive blog series. thanks everyone for playing it out with me. i've really enjoyed everybody's input and enthusiasm for this quest. michele, nice sleuthing. i see what you mean about the metal part. another dead end. andrew, have fun running up and down Greenwich St! and Teri, i second that--"may everyone find their lost diner"--and, if you do, keep us posted. This would make a great In Search of... project. And Merrill's line "Head bowed, at the shrine of noise..." is priceless. I went prowling around the area last night in the rain. It was late - after midnight - and there were three people in Two Boots. The curved window, to me, does not look right. But, the three people sitting snugly inside, out of the rain and wind, illuminated by a bright, cheery light, made me smile. I don't think the diner in the painting is any one physical place, but is a common place we can all visit when we talk about it. Goggla, that's where "my" Nighthawks diner stands, too. unfortunately, Two Boots doesn't serve coffee. I imagine you ruled out the corner of Greenwich/13th/8th Avenue in the Café Brussels location? That was my first thought. you know, Baroness, i looked at that corner just yesterday and thought, "Damn...I missed that one." there's plenty left for others to follow up on. This was really a great series. Awesome work. Thanks! i keep looking at this and thinking, oh god, what if the legend is true? and the original inspiration for the Hopper diner was a WHITE CASTLE? Someone beat me to it, but I have often thought Hopper's diner might have been at the intersection of 13th Street and Greenwich Avenue -- 118 Greenwich Avenue -- where the Cafe de Bruxelles was until recently. The angle just seems right. And Hopper's diner strikes me as being situated off a side street between two primary avenues, as that address is, not right on a busy avenue. Just my hunch. I'd love to see Jeremiah do a little research on that location (or would I? If I learned from him that it was never a diner, I'd be disappointed). Great series! Thanks. I really do want the diner to still be here somewhere, but I'm resolved to the likelihood that it's either gone or was never there. And I never miss a chance to look at the painting when I'm in Chicago. BUT, you took it one step farther and did the thing that was really far down on my to-do list, and that is scoping out other possible locations along Greenwich. Congrats on that and thank you for doing it! My primary focus has been strictly on the corner referenced by all the folklore and rumors that had come up so far. I have come to a semi-conclusion that a few things may have actually been based off of the White Tower burger joint that stood in Mulry. I obtained a book called "White Towers" that gives a history of just about all of the White Tower locations nationwide. Sadly it doesnt include the one in question but it does include some photos from the early 40s showing the servers and stuff and they look exactly like the one gentleman in the painting. The items on the table in the pictures match the items painted as well... Almost a direct copy as if he had these pictures from the book to work from... Ill try to get them posted on my site this week sometime. As evident by my first paragraph on my site, I too have come to the conclusion that Hopper assembled fragments of real places to form the perfect setting for a diner that never existed. There is too much evidence to support this. I was overjoyed upon reading about Two Boots and the new-to-me "diner" that appeared on Perry in the 1950 land book. Your reasearch has provided more great info to add to the never-ending quest for this lost piece of architecture. Consider yourself very lucky as you posess something very valuable, and that is the ability to actually go and scout these places out in person. Im currently sitting in my hometown of Minneapolis, Minnesota typing this, having only been to Ney York for a half hour to switch airports. In regards to the mystery diner on Perry, have you ever gone into the faciility that is there now and asked around? Elderly people will sometimes be so happy that a youngster is interested in their history and will tell you more than you could ever posibly want to know. It may be possible to trace ownership back through the decades here. Just remember, since the invention of the camera, there are pictures of just about everything in existence and If we can come up with that many photos of the original Mulry lot in question, there has GOT to be at least one photo in the world of the mystery diner. Thank you for taking the time to do this and please keep me posted if you decide to further continue this quest! Jamie, thanks for writing in about your research. amazing that we were both on the same trail! maybe we crossed paths. you've got some great shots that i did not see before, which does seem to further confirm the absence of a diner on that spot. it's tough to think that a White Castle was the inspiration for Nighthawks. that's like a McDonald's being the inspiration. it would be a fierce irony if so. please keep us posted and send links as you continue your search. Anyway, I sent your blog to my mother in Chicago who incidentally helped launched the country's largest WPA restoration project and, similar to what you did for this article, was trying to find archival photos Chicago public schools to pinpoint where certain WPA work hung - or in many cases - had been painted over! Great job on this. Really great work. FYI. Tomorrow, June 26, 2010, descendants of Thomas M. Mulry will be having a rededication of Mulry Square. They are starting the day with a 10am mass at St Joseph's Church on 6th ave.
After the mass the entire group will be led by bagpiper to Mulry Square. My mom (80 yrs old) and her older brother will be there (grandchildren of Mulry). You may want to show up to ask questions about their memory of the area. Thomas Mulry lived at 10 Perry and had 13 children. "It's like looking at the young-woman, old-woman illusion, where first you see a withered crone, then your brain adjusts and the girl she used to be appears before your eyes." I came here via a link from James Lileks' The Bleat; you may get a bit of traffic from his readers today. Great work and an enjoyable read! thanks Kev. maybe seeing the young woman means you're more of an optimist? don't know. and you're right, Lileks has a lot of readers. welcome. thanks Luke. one of the Mulry grandchildren got in touch with me, asking about the diner--probably one of your uncles! i won't be able to make it, but hope it goes well. if you hear of any diner memories, please let us know. Great research, and a fun read. Perhaps instead of a fake townhouse facade, the MTA should build a fake facade that replicates the Nighthawks diner. Even if it weren't historically accurate, it would be an entertaining nod to the legend. Scott, a fake Nighthawks diner on that spot would be so weird, so wrong, in so many ways, that it would be kind of great. I am not familar with New York records or permitting, but wouldn't a building permit have to have been issued in order to build a second story on the Chinese restaurant? An engineer would have had to review the plans for the existing building and approve the additional structure, wouldn't they? Perhaps knowing the date of the add-on would lead you to some info on the original condition of the building. Excellent writing. I really enjoyed every installment. These are the White Tower images I was talking about, along with some of Hopper's preparatory sketches placed beside them. 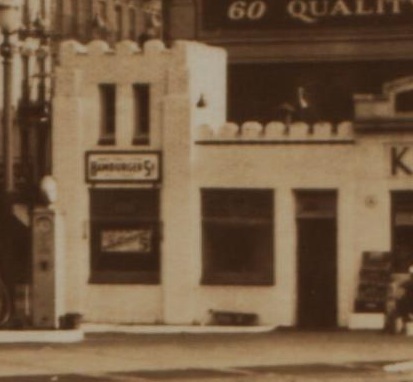 I know when you think of a White Castle today, you think of some commercialized burger joint, but back then they were a little different and after seeing these pictures again, I have a very strong feeling that a lot of the painting was in fact based off of the White Tower that stood in Mulry Square. And here is the interior of a White Tower in the early 40s, complete with a patron that is sitting at that PERFECT hopper angle! Jamie, nice pairings. and the White Tower, as it was, looked pretty cool. Hopper might have taken pieces from it. but the coffee urns, i read in Levin's Hopper biography, came from someplace called the Dixie Kitchen. i don't know--i'm sticking with the composite story. the exterior of the White Tower really looks nothing like the painting. maybe the salt and pepper shakers, though! Oh I am also still totally sticking with the idea of the "multiple real places assembled into one perfect imagined setting"! Right when you said "Dixie Kitchen" though, my brain clicked and I suddenly remembered reading that paragraph too. So much for the coffee urn idea! Im definitely keeping at the research. We WILL find someone or somewhere that has a picture of the mystery diner on Perry! Or maybe a shot of this "Dixie Kitchen"! I still have a few people to contact that may be of some great help! As always, Ill keep you posted! i think a lot of things looked the same back then. soda jerks all wore those white paper hats. coffee urns were tall and silver. shaped canopy supported by a single Lally column at the apex. side (Nos. 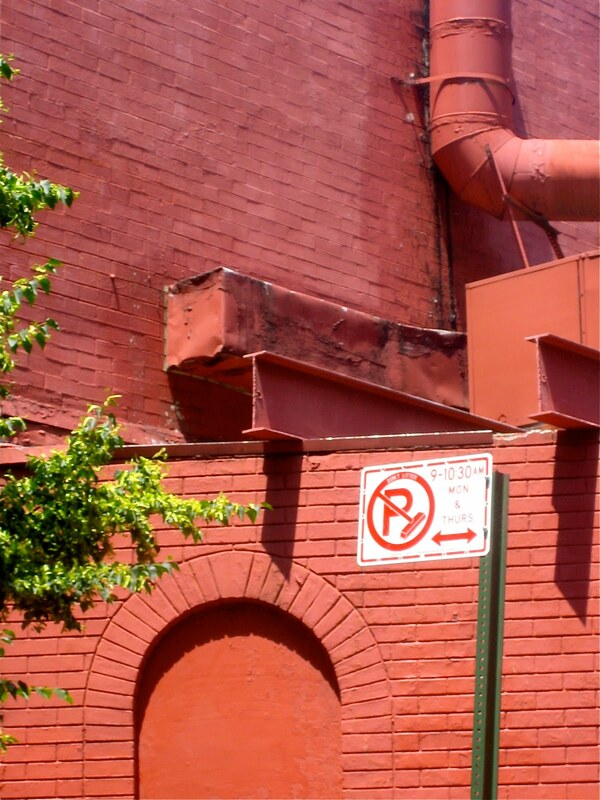 3-5) is of white brick with round-arched windows and entrance door giving access to the bar." at least we now know that it was white before schezuan village got a hold of it! Im still on the hunt or a photograph and still have some people to contact regarding this! Jamie, how on earth did you find that description? Here is my own story of the search for the Nighthawks diner. In November 1987 I bought a Nighthawks reproduction from a hole in the wall art store on the west side of 7th Ave., across the street from the empty triangle. The price was $95. As he was wrapping it for me, the old man that owned the store pointed across the street and said: "That's where it actually was, the restaurant. And I remember Hopper very well in the early 40's". Since 1987, I walked by the empty triangle many times, convinced that it was indeed the place. I did some research on my own and found Hopper's own reference to the Greenwich Ave. location. really persuasive is the brick building in the background. If you go back to Geenwich Ave. you will find it on the north side, across the street from the triangle, where it should be according to the painting. It may be 68 Greenwich Ave., where the Elephant & Castle restaurant has been since the 1970's. I think that the relevance of that brick building to the mystery (and to the painting) must be looked at. A few years ago I contacted Gail Levin, offering her my discovery, which she had made on her own, of course, and proposing that some official marker should be placed on that corner. I have discussed the marker idea with other people. sorry Benny, what i think is that the Nighthawks diner was not in that triangle, as much as many people want it to be. in that triangle, at the time the painting was done, well before and well after, was a White Tower hamburger joint and a gas station. the white brick building you see there was the gas station's garage. the only way Hopper's diner could have stood there is if he painted the White Tower burger joint. take a closer look at the photos of the triangle here, and see what you think. I'd like to hear some feedback from engineers about the viability of such a construction in the first place. Custom curved windows and a sole thin supporting pillar? I'm a huge fan of the painting but as to the veracity of the source, I'm not convinced. Being a brazilian who lived for a little while in NY on 12th st. btw 7th and 8th avenues and who loves the city very much, your posts on Finding Nighthawks were just wonderful to read. Thanks!!! I have always thought it is an improvised scene that was inspired by the corner of Perry and Greenwich Ave. When you walk on Perry approaching Greenwich and look at the shape of what was a restaurant there on the east corner, (now a salon) and look across to Fiddelsticks and Gottino, you can see how it might have been. The photo of the building behind the movie theatre on Greenwich Ave was last known as McCoy's... a bar that was demolished along with the the theatre in 1969. 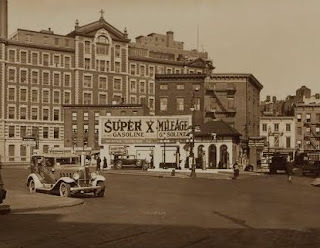 I grew up on Greenwich Street between 12th and Jane in the 50's and 60's. nice article and great subject. to bad there is not yet a definative answer. but i enjoyed the read and the passion put into the research. The location of the Nighthawks diner is a couple of blocks from the house he grew up in on the corner of N. Broadway and Main Street in Nyack, NY. There is a pizza parlor there now. My great grandfather and his friends always talked about this diner and how they used to go there as kids. My father born in 1937 barely remembers the diner but always remembers my grandfather, uncles and friends talking about it. Before Empire Szechuan, that corner south of the white tower location was the Greenhouse Diner (or Restaurant, i forget which word). it had an irritating 13 hour clock in the facade. I remember when it was being built and i can definitely tell you that some of the previous structure (which of course i cannot picture in my memory) was saved and reused in the Evergreen (and current) structure. That would be the Perry St fragment of wall that you correctly identified from the angel of the entrance. of course memory is totally a liar, but i do seem to remember getting coffee there--but whether that is confounded by later actualities of getting coffee at the Greenhouse, or lunch at E.S., well..i can't say at this late time. This is some impressive research! and great fun for the reader. Late to this party, but I really enjoyed the read. Thank you so much for putting in the leg work to do this. The results aren't nearly what we want, but there was the thrill of the chase, and for that thrill, I thank you.